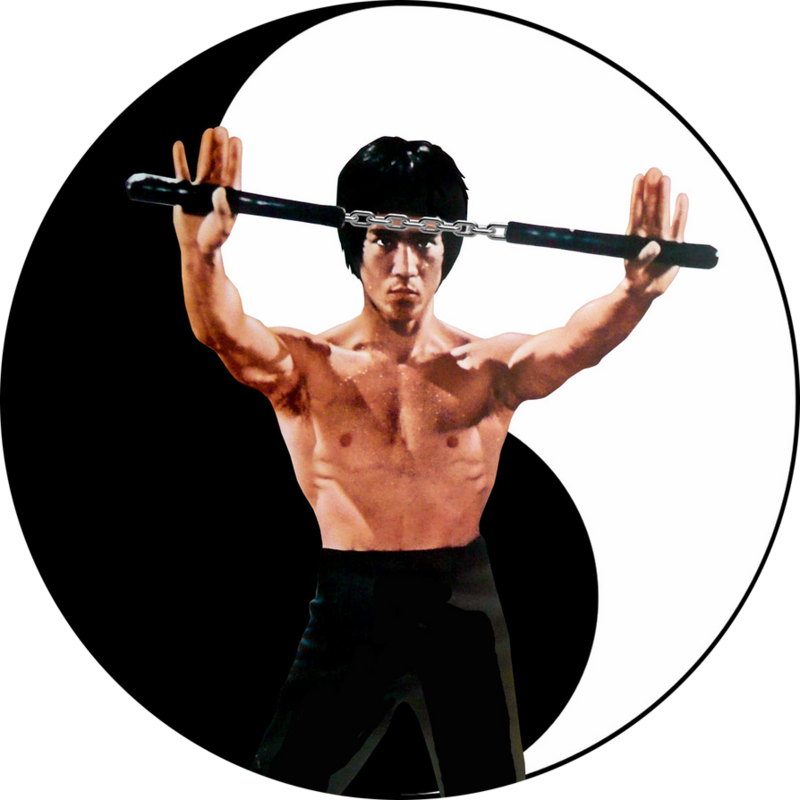 I'm not sure how many people these days outside of the martial arts scene even remember the nunchaku, the iconic Okinawan weapon that Bruce Lee made famous in the Western world. It started out as a rice flail, a tool farmers used to crack open rice husks before winnowing the husk from the grain; like other farmyard implements, it got pressed into service as a weapon once Okinawa came under Japanese rule and laws that prohibited commoners from owning swords were enforced by the new government; like other farmyard implements, it then got taken up by an assortment of local combat arts that, over time, evolved into the various schools of modern karate. For reasons that still make me scratch my head, the state legislature of New York banned nunchaku in the state -- as in, you couldn't even have one in the privacy of your own home. Recently, though, a martial artist named James Michael Maloney got busted for having a nunchaku, and sued. His case finally reached a ruling, and the judge found the law unconstitutional, pointing out that the Second Amendment doesn't specify firearms and therefore martial artists who wanted to work out with this elegant and effective device were free to do so. This strikes me as good law, and it's also nice to see a certain very common sort of Puritanism -- "it might hurt someone, we must ban it absolutely!" -- get taken out with the legal equivalent of a good hard side kick to the head. Kudos to Judge Pamela K. Chen for a crisp judicial knockout of a law that badly needed clobbering -- and congratulations to the karateka of New York State, who can break out their bootleg nunchaku and get to work learning nunchaku kata for the first time in more than four decades. I found a copy of W. Somerset Maugham's The Razor's Edge in a used book store in Seekonk, Massachusetts -- I suspect Maugham would have had fun with that in an essay or a story. I hadn't read anything by him before, and am planning on reading much more of him from here on in. That's partly because The Razor's Edge is a brilliant novel: witty, thoughtful, in places tragic, in places astonishingly funny -- the scene at Elliot Templeton's deathbed had me laughing so hard it took me some minutes before I could start reading again, for example. (I know, I know, you're not generally supposed to laugh at the scene where a character dies, but I made an exception here and so, dear reader, will you.) But there are two other things about The Razor's Edge that have me convinced I'm going to read it many times over. And yet it works. It's a lively, readable novel. It reminded me forcefully that a novel is ultimately just a sequence of words that tells a story, and exactly how those words tell that story is entirely up to the author. I'm going to be rethinking a lot of my basic presuppositions about how a novel can be written. The second thing that makes me think I'll be going back to The Razor's Edge as often, perhaps, as I go back to Hermann Hesse, is that Maugham gives a brilliant snapshot of the first stirrings of a cultural phenomenon that seems finally to have ended in my own time: the awakening of American culture to the spiritual traditions of Asia. Strictly speaking, there were foreshadowings of that with the Transcendentalists, and then again by way of Theosophy, but it was between the two world wars that the first trickle of Americans began going to India to sit at the feet of gurus -- a trickle that eventually became a flood, and embraced many countries other than India. Larry Darrell, the central character of The Razor's Edge, is a fictional equivalent of one of those pioneers, the people who made it possible for yoga to become a common lifestyle option for bored suburbanites today. That sounds unduly cynical, doesn't it? The thing is, that's the natural trajectory of such things. It was because a few American servicemen stationed in Okinawa talked a local sensei or two into teaching them karate that Asian martial arts became such an amazing cultural presence in the 1960s and 1970s, with all the Kwai Chang Cainery of fortune cookie mysticism and flashbacks to the Shaolin Temple shot through lenses smeared with vaseline that American pop culture slathered on them -- and then, in due time, settled back down into useful methods of fighting. America's great Journey to the East was an astonishing cultural phenomenon, one that deserves to be the subject of a narrative history or two, and it's something that changed this nation in a range of ways from the silly to the subtle to the profound. Some of its legacies are certainly permanent features of my thinking and my life -- and Maugham's story reminded me vividly of several times in my life when I turned Eastward with something like the usual blend of giddy romanticism and spiritual yearning.